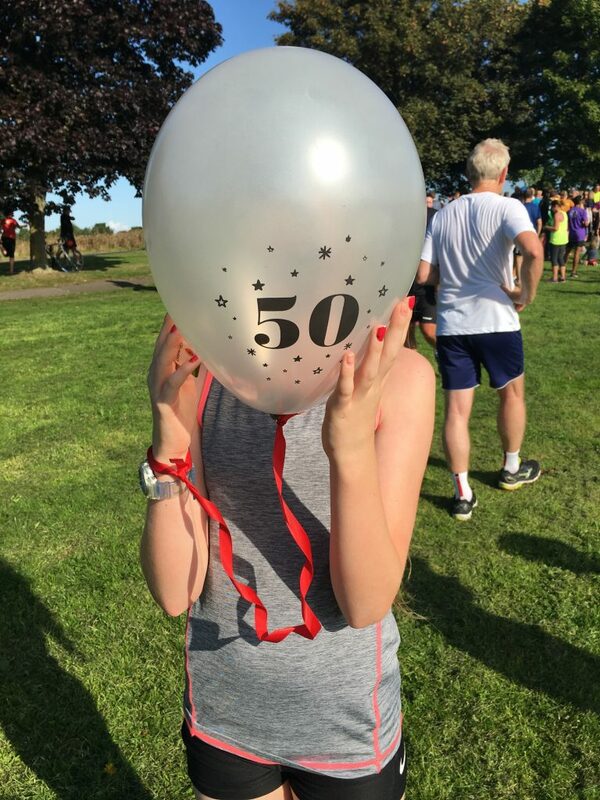 On Saturday 2nd September, my daughter ran her 50th Parkrun. We started on the same day in May 2015. She never fell in love with it like I did. It was only ever something she just did. Often, she didn’t even enjoy it. She missed Parkrun for panto and other stuff kids do on a Saturday morning. She missed it because she just didn’t feel like doing it and didn’t want to do it any more. So I didn’t force her. But in spring of this year, she got her mojo back. Having always beaten herself up over being slow, she started running with a slow friend and took the pressure off herself. They chatted, they walked, they cartwheeled, they dabbed and sometimes they even ran. Most importantly, they enjoyed themselves. And my girl became a regular Parkrunner again. It doesn’t matter to me how fast or slow she runs, I just like that she gets up and out on a Saturday morning and runs three miles. That’s a great achievement, however old you are and however fast or slow you run. She missed a lot of runs over summer, thanks to endless weeks of being busy – camping with her Daddy and their friends, a trip to Weymouth to visit friends, her Scout camp and our holiday to Padstow – but then she was back on track and heading for her 50th Parkrun! She was quite excited as she knows it’s a real achievement. And I was very excited and proud of her. I’d been given strict instructions not to cheer too much, but she had decided she wanted ’50’ balloons to run with! Every week before the run, the Run Director reads out the names of everyone who has reached their 50 or 100 Parkrun milestone. Our Parkrun has been going for nearly five years, so there are a lot of people. After my daughter had run her 49th, they posted on Facebook that they weren’t going to routinely read out 50s or 100s any more and people had to let them know if they wanted a name calling out. Ironically, I blame my husband for this. He reached his 49th Parkrun, then missed loads of weeks for pretty much the same reasons as my daughter (plus his Three Peaks Challenge). They ended up reading his name out for five consecutive weeks before he actually ran his 50th. So I messaged them and asked them to read out my daughter’s name. On the way to Parkrun, we realised we’d left the balloons at home and there was no time to go back and get them.Typical! We stood at the front for the announcements and they asked if my daughter was there. They went on to say that she’d done 50 Parkruns and she’s only 11. And everybody cheered, not just me. There’s not that many kids run regularly enough to reach their 50 milestone. Of the 50 under 18s running that day, just 18 have reached their 50th Parkrun. And my mum nipped home to get the balloons, so she had them for most of the run. My younger son was running for the first time in two months. As he was aching from rugby training the previous day, he chose to run with my daughter (and ended up carrying a stray balloon), which was lovely. They didn’t break any records with their times, but they enjoyed it. I’m very proud of my daughter for reaching her 50th Parkrun milestone. Here’s to the next 50 for her! That’s brilliant Sarah, well done to her! I love that she wanted to run with the balloons too, it’s great that she’s not afraid to celebrate her own achievements. Thanks, I love that she wanted the balloons! When I reached my 50th I was under strict instructions not to cheer or do anything to draw attention to myself! Wow- 50 park runs. I’m impressed! I’m sorry to admit that I’ve never done a park run… so I find this very inspirational! Thanks very much! You should definitely try a Parkrun – they’re great fun! And you don’t even have to run all the way, more and more people are walking them these days. Thanks very much! 25 is a good total. It’s great that you enjoy it. I’m getting close to 90 now. My aim is 100 by Christmas! Thanks very much. It’s a great start to a Saturday! I admire her persistence, even when she doesn’t always feel like doing it. It will be a long time before her brothers reach the 50 milestone!